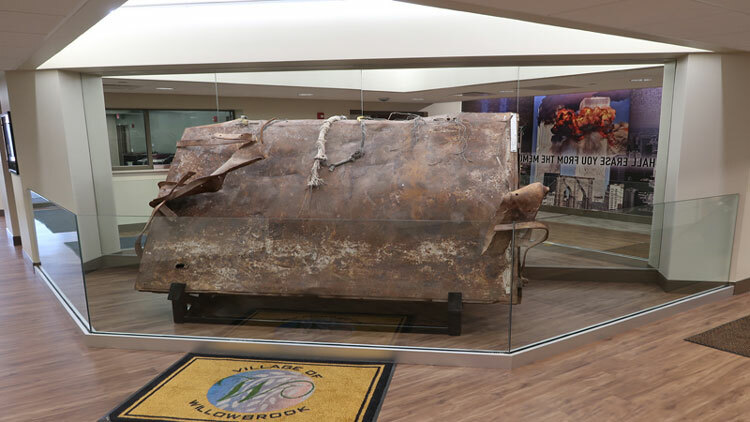 Chicago — Raths, Raths & Johnson, Inc. (RRJ), a Willowbrook, Ill.-based national architecture, engineering, and forensics consulting firm, provided structural engineering services for the design of a 9/11 Memorial as part of the renovation to the Willowbrook Police Station. A dedication ceremony of the 9/11 Memorial was held at a community-wide open house of the police station on Sept. 16. The 9/11 Memorial features the remains of an elevator floor platform and support framing system recovered from the World Trade Center Tower 1 wreckage. This artifact consists of two individual pieces with the elevator floor isolated from the steel support framing system by rubber bushings. RRJ collaborated with the Village of Willowbrook representatives and the project architect to design a support platform to orient the artifact for display. RRJ carefully documented and analyzed the 1,500-pound artifact to understand the overall weight and center of gravity of the piece. RRJ prepared a 3D computer-generated model to assist the design team in visualizing the proposed support frame and the artifact presentation. The tubular steel frame design supports the artifact without detracting from the orientation and presentation of the piece to the public. Mirrors were added to the wall behind the display to assist the public in viewing the elevator structural steel framing on the underside of the artifact. Displayed in the police station lobby, a glass railing was added to demarcate the artifact within the lobby area.